Google+ has recently included one feature which enable to keep track on public view counts for pages and photos. If you want to track the popularity of your posts, public view counts for photos and pages then yes you may see this right now. How to check the count ? The total number of view counts can be seen just below one’s Google+ page or profile photo. The total number is calculated since October 2012 and how many times one’s posts, photos, and profile page have been viewed. Though Google+ has provided their users with an option of hiding their views if they don’t want the number to be known to all. How to hide the view count ? You have to click on the Home button, then go to Settings and scroll down to the Profile section. You can then check or uncheck the box next to ‘Show how many times your profile and content have been viewed.’ Below is a screen shot from the settings. 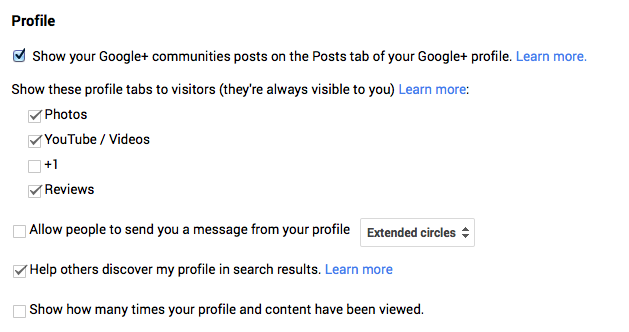 People who are having a business Google+ Page can also change the setting. They have to go to the Pages and then click Manage This Page. Then go to the Dashboard by clicking the option in left side. Select settings and scroll down to Profile and simply check or uncheck the view count box as page owners wish. This feature has been enabled for non-mobile users only as of now.